UPDATE: Hazel was adopted! 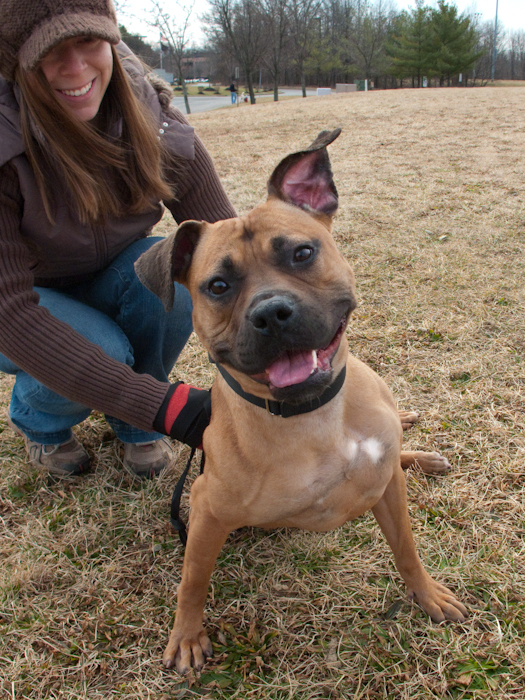 Hazel is a wonderful American Staffordshire Terrier Mix who came to the shelter as a stray. We estimate her to be about a year old as she appears full grown but still has that youthful energy. Hazel is an absolute sweetheart! At first she is very active on the leash, wanting to explore everything all at once, but when she slows down, she just wants to curl up and be loved! Her favorite place is between your knees where she can snuggle up close and get kisses. She knows how to sit but most often ends up rolling on her back for belly rubs. Hazel really needs a nice home where she can get as many kisses and belly rubs as possible!! Come meet her today! If you are interested in learning more about Hazel or fostering/adopting her, please contact us or fill out an adoption application online! Click Here to download an adoption flyer for Hazel!